Earlier in the week we shared a bit of a history of MacPhisto as part of a spoiler news story. We’re reprinting it here now as we’ve lifted spoilers, but be warned this does include information about songs played in the new show and scenes that are played out on the #U2eiTour stage. 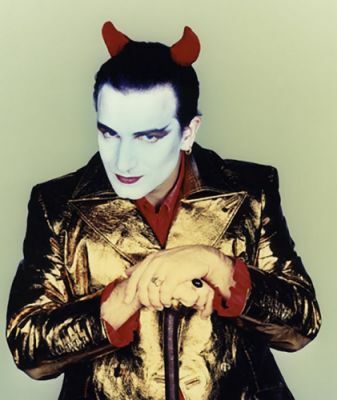 Bono was heard practicing MacPhisto’s banter throughout rehearsals in Laval including the line above at the end of “Hold Me, Thrill Me, Kiss Me, Kill Me”. He was heard in Tulsa introducing the Intermission, “Hold Me, Thrill Me, Kiss Me, Kill Me”. In Laval he was heard at the end of “Hold Me, Thrill Me, Kiss Me, Kill Me” over a funky remix reminiscent of the “Influx Remix” of “Elevation” – he took the stage to introduce himself as his alter ego, the singing devil in platform shoes, Mr. MacPhisto. Mr. MacPhisto is a stage character created by Bono for the Zoo TV tour as it wound through Europe in 1993. The name refers to Mephisto (sometimes written as Mephistopheles), a demon in German literature, who works for Lucifer. On the third leg of the tour, MacPhisto would appear during “Desire” after the encore break, and would finish out the encore in costume. For the fourth leg of the tour, Bono would be seen in a dressing room on screen getting into character, red shirt, gold lame suit, devil horns and white face paint with red lipstick. He would make his way to the stage, and would address the crowd, and would then make a phone call. For the final leg of the tour, “Daddy’s Gonna Pay for Your Crashed Car” started the encore and would be where MacPhisto would appear. He is present at the show in Sydney where the video from the Zoo TV tour was recorded. It was his appearance in that video that started a small fascination with the character for me. One of the more memorable appearances of MacPhisto was in London, when he called Salman Rushdie on the phone, but indeed Rushdie is in the stadium, and would eventually come out and join MacPhisto on stage, giving him a big hug. The appearance by Rushdie who had spent years in hiding made press around the world. The final call, in Tokyo, on December 10, 1993 was to Madonna. It was the last show of the tour, and Madonna was in attendance at the concert. She was watching from the soundboard, and had been seen with a portable phone, perhaps to take a call during the show. But although he called her from the stage, no connection was made, and the call went unanswered. At the end of 1993 MacPhisto went away. Willie’s diary for the final night of the tour read, “plus of course Mr MacPhisto’s last stand, though somehow I’m not sure we’ve seen the last of him.” MacPhisto appeared in the video for Zoo TV released in 1994, capturing the 1993 performance in Sydney, but it would be many years before he would make an actual live appearance again. MacPhisto also appeared in U2’s video for “Lemon,” directed by Mark Neale. Bono isn’t wearing the horns here, but MacPhisto is instantly recognizable from the suit, the make up and the actions on screen. Bono would also make an appearance in Rome, doing photo shoots throughout the city, and walking across the square at the Vatican in character, wearing sunglasses for some video footage and additional photos. In 1995, MacPhisto nearly made the jump onto the big screen. Joel Schumacher, the director of Batman Forever, had met with Bono while working on the movie to discuss an onscreen role. Initially it was thought Bono would play a villain, but there were two evil characters in the script already. Instead, Schumacher considered having Bono perform a song in costume as MacPhisto. That idea never materialized, either, and so U2 ended up contributing a song, “Hold Me, Thrill Me, Kiss Me, Kill Me,” for inclusion in the film. But MacPhisto did make a reappearance with “Hold Me, Thrill Me, Kiss Me, Kill Me,” appearing in animated form in a promotional video for the song. The video itself depicts two super-powered animated characters battling throughout a city. We also see U2 performing on an animated Zoo TV stage on a rooftop in Gotham City (complete with an animated Riddler running around). Batman and Robin also make appearances, but most of the animated footage is of “The Fly” and “MacPhisto,” two onstage personas Bono had created for The ZOO TV Tour. In fact the video for the song, is a sort of origin story for MacPhisto. We see Bono walking down the street reading a book, when he is struck by a car driven by Elvis. We then see him strapped to a hospital bed where we see his death. MacPhisto is born as lightning strikes Bono in the hospital bed. Like The Flash in comic books, the lightning gives him his powers, and he is later seen flying around in a winged car harassing Batman in his Bat Plane. In 1997, MacPhisto would make a tiny appearance in the PopMart tour. As the band would perform “Hold Me, Thrill Me, Kiss Me, Kill Me” the MacPhisto symbol would flash on the screen under the arch. They symbol, a yellow oval reminiscent of the Batman logo, has an image of Macphisto in the centre instead of a bat. The logo can be seen as part of our title banner above this page near the bottom of the image. 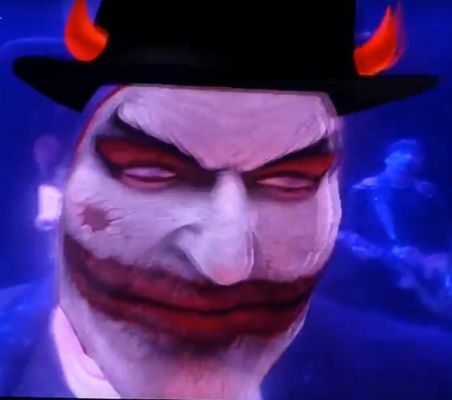 MacPhisto would also appear among the many celebrities that flashed up on the screen during the song. In November 2016, Bono appeared on Jimmy Kimmel Live’s second annual (RED) (Shopathon) episode. During the episode, Bono joined Kimmel, DJ Khaled, Neil Patrick Harris, Halsey and The Killers as well as others for a song titled “If We Don’t Help People with AIDS, We’re Going to Hell”. The motley crew of artists was titled, the “(RED) Pack”. Bono makes his appearance partway through the song, appearing in a smoking bathtub, holding a bottle of champagne in one hand and the mic in the other. 23 years after MacPhisto last appeared, he appeared again, with an updated outfit, a shiny red suit this time instead of his standard gold, and far more pronounced eyebrows this time. The white face make up and the attitude are present. He later climbs out of the bathtub and joins the other celebrities at the piano for the finale of the song. MacPhisto appeared and was quickly put away again. But he’s not been far. During the iNNOCENCE + eXPERIENCE tour in North America, Bono would use a bull horn on stage, and in the centre of the bullhorn was MacPhisto’s photo each night. The same prop was used recently in promotional shows for the new album, Songs of Experience when U2 has been performing “American Soul”. A fan dressed as MacPhisto was invited on stage during an iNNOCENCE + eXPERIENCE tour stop in Berlin in 2015. Bono had previously invited a fan dressed as MacPhisto on stage during the PopMart tour in November 1997 and on the Elevation tour in July 2001. That brings us up until now. MacPhisto returned in Laval a few weeks ago, during rehearsals. As part of an intermission, or perhaps still played live, “Hold Me, Thrill Me, Kiss Me, Kill Me” was heard, a song that MacPhisto is intimately tied to from the appearance in the video. At the end of the song he introduces himself, in case we’ve forgotten who he is, and tells us he’s here to sing for our souls as he breaks into “Elevation.” It is only the second appearance of MacPhisto on North American soil after the appearance on Jimmy Kimmel. And he couldn’t be seen, only heard. 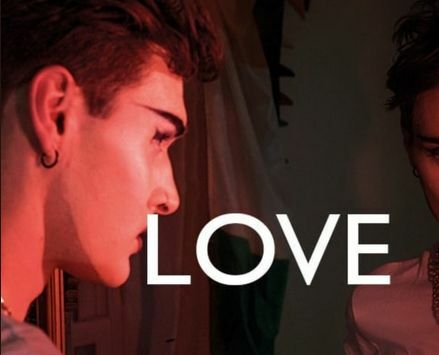 Last Thursday as part of the promotional campaign for the song “Love is Bigger Than Anything in Its Way”, U2 released a series of images as Instagram stories. The first image features a young man, in makeup reminiscent of the MacPhisto character, lit in red. The internet instantly lit up with speculation that MacPhisto had returned. Knowing he is being teased in the stage show at this point it makes us think this first glimpse of the video was intentional and U2 may have wanted to remind us of the character. The Zoo TV tour never wound back through North America after the introduction of MacPhisto, and now a whole new audience gets to witness him come to life, although in a much different way. In an animated video that accompanies the intermission song, “Hold Me, Thrill Me, Kiss Me, Kill Me” (performed by Gavin Friday) we see a shadowy figure in a top hat. He gives his card to the members of U2 after rescuing them at sea. The card reads “Wormwood & MacPhisto Inc., Bespoke Atonement Services” and he gives the members of U2 gifts. Bono gets sunglasses and style. Larry Mullen gets a belt buckle that says “Eternal Youth” and gets strength. Adam gets wings and ambition. And The Edge gets a hat, and god-like talent. Wormwood is a reference to a character from The Screwtape Letters, in the book by C.S. Lewis, the demon Screwtape sends a series of letters to his nephew Wormwood, a Junior Tempter. It seems Wormwood and MacPhisto went into business together. The Screwtape Letters is also one of the books present on stage for this first night in Tulsa. Bono plays with the character for the first couple of songs out of the Intermission. We finally see him becoming the devil. There is a mirror on screen and when Bono looks into the mirror, his face is projected on screen with a devilish face overlaid over his own features. MacPhisto is back!